All season use is available with this Meyer Hotshot 85 Spreader that allows you to spread sand, salt, limestone, fertilizer and other granulated materials in the 1.0 cu. ft. hopper. Adjust the speed of material flow with the conveniently located material flow adjustor. 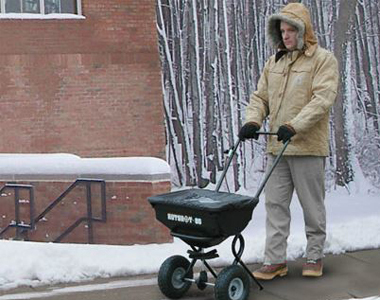 And, push this spreader over slick snow and rough terrain with the 10 inch pneumatic wheels. 85 lb. 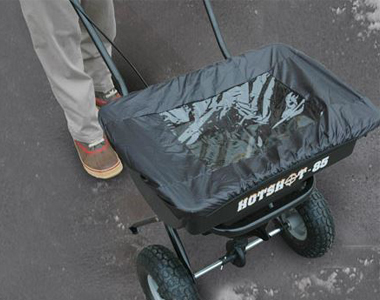 Capacity: Carry up to 85 lbs. in the 1.0 cu. ft. hopper to reduce fill up time. Adjustable Material Flow: Adjust the material flow speed with the controller that is located conveniently near the operator handle on an easy grip U-shaped handle. Plastic Cover: Keep your material dry and visibly see when you are running low with the all-weather, see-through plastic cover. Polyethylene Hopper: Ensure a long life that is rust and corrosion free. 10" Pneumatic Wheels: Travel over snow and rough terrain with the 10 pneumatic wheels. 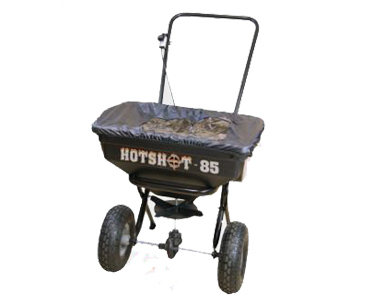 Ask us about the Meyer HotShot 85 All Season Walk-Behind Broadcast Spreader . Please no repair questions. Your Q&A may be posted to SnowblowersAtJacks.com to help other shoppers, like you, with their purchasing decisions. Thank you.